A woman has been arrested for destroying her SUV with a powerful flamethrower that she bought online. 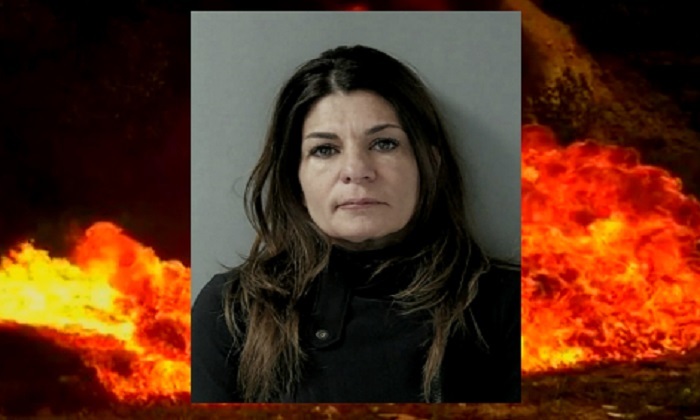 Julie Gagne, 47, of the village of Barrington in Illinois, initially told police that her 2016 Infiniti QX70 was stolen while she was having dinner in a restaurant on Nov. 10. Police and firefighters found Gagne’s burning vehicle in a location less than two miles from where she lives. An X15 Flamethrower made by Xmatter was discovered not far from the torched vehicle. Police later learned the flamethrower (the same type seen in action in the video below) was purchased online by Gagne who has since retracted her statement. On Nov. 21, Gagne handed herself into the police who have charged her with arson, disorderly conduct, and filing a false police report, said local paper the Arlington Cardinal. Her weapon of choice is sold for around $1,600. It uses a mixture of fuel and napalm to shoot out flames as far as 50 feet. Flamethrowers are legal in all U.S. states except for California where punishment for the possession of one can result in a year’s jail time or a $10,000 fine.